Open your home to a Ducks player or coach in 2019 – benefits included! (Central Islip, N.Y., Jan. 17, 2019) – Welcome a professional baseball player into your home this year! 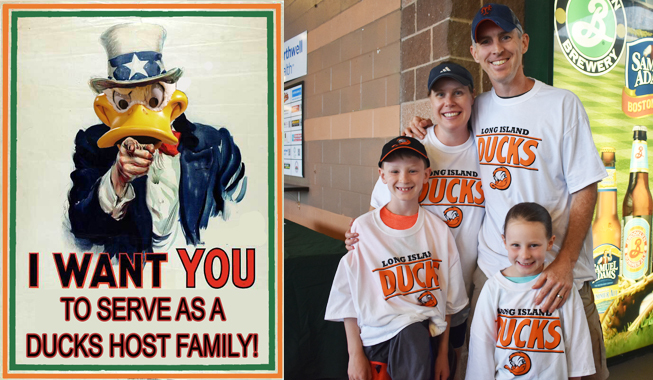 The Long Island Ducks are currently seeking host families throughout the Long Island community for Ducks players and coaches during the team’s 20th Anniversary Season, presented by Good Samaritan Hospital Medical Center. Being a host family is the perfect way to become a true member of Long Island’s hometown team. Families have the opportunity to develop lasting friendships with a member of the Ducks off the field while also getting to cheer them on throughout the season. Both players and families have repeatedly spoken glowingly about the experience and bonds that have been created. Additional amenities that you are able to provide will be greatly appreciated by the player and team. Interested? CLICK HERE to fill out and submit the Host Family Questionnaire. The Ducks are also seeking housing that is available to rent for players during the 2019 season (April-September). Landlords with available properties should contact Gerry Anderson by calling (631) 940-3825 ext. 114 or emailing ganderson@liducks.com.